A tremendous band of badass heroes fight to protect the universe’s very last star from a mysterious evil in this next-gen shooter. Slash and parry, run and gun, cast and dash, or simply obliterate foes while building and growing your personal team of heroes. Story Mode: Battleborn’s Story Mode is a narrative experience to save the Last Star and it can be played entirely singleplayer and is even better when it’s played cooperatively with friends. Loot/Gear: Players can pick-up loot packs in Story Missions or purchase them using credits they earn by playing both Story Missions and Competitive Multiplayer matches. When opened, loot packs produce gear, which can be added to a character’s loadout to modify that character’s gameplay. Friends and foes alike will know you were one of the first to take up arms with the Battleborn when you show up to the fight in your exclusive gold regalia. Pre-order your copy of Battleborn and deck your heroes out with an exclusive in-game title and golden character skins for Thorn, Reyna, Montana, Marquis, and Rath. Unlock the Firstborn Pack by being among the first to join the fight to save the universe! © 2015 Necromonger, LLC. Published and distributed by 2K. 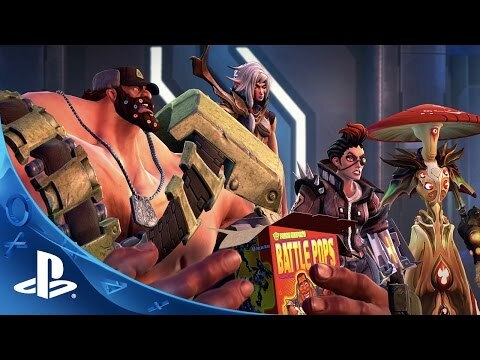 Gearbox, Battleborn, and the Gearbox Software logos are registered trademarks, and the Battleborn logos are trademarks, all used courtesy of Gearbox Software, LLC. All rights reserved. 2K and the 2K logo are trademarks of Take-Two Interactive Software, Inc. All marks are property of their respective owners.